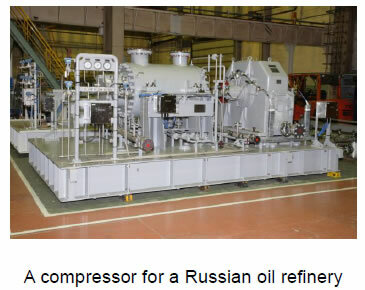 Moscow, September 12, 2013 --- Hitachi, Ltd. (TSE: 6501 / "Hitachi") today announced that it has been awarded ‘Best Supplier of compressors for oil refineries’ by results of survey of oil and gas companies in Russia. This award is bestowed on manufacturers that supply outstanding equipment for oil refineries and awards ceremony held at the Moscow Annual Oil & Gas Conferences*1. This award, established in 2013, was created with the aims of recognizing outstanding achievements by oil refinery good suppliers in Russia, including those who contribute to the further development of the country’s oil refinery industry. The selection committee comprises representatives from four major Russian oil companies: Gazprom Neft, LUKOIL, Surgutneftegaz and Tatneft. This committee and the Russian government’s Energy Committee jointly conducted surveys and interviews of 48 domestic refineries regarding equipment manufacturers. Based on the results, they bestowed awards in seven categories, including compressors. In the pump-compressor equipment category, Hitachi received the highest score of the maximum possible five points, resulting in it winning this award. Hitachi was the only manufacturer in all of the categories to receive full marks. The awards ceremony was held today at the Moscow Annual Oil & Gas Conferences in Moscow at the InterContinental MoscowTverskaya Hotel. Hitachi opened an office in Moscow in 1982, which has spearheaded efforts to develop business in Russia, particularly in social infrastructure. In the compressor business, Hitachi delivered 21 compressors for an ammonia manufacturing plant in 1972. Since then, the Company has chalked up more than 170 orders to date. Today’s award and high marks recognize not only this extensive track record, but also its high quality, project coordination capabilities anddetailed after-sales services. Toshiaki Higashihara, Senior Vice President and Executive Officer, President & CEO of Infrastructure Systems Company, said, "We are extremely proud to win a Best Supplier Award from the Moscow Oil & Gas Conferences. As it directly reflects the opinions of customers as well as the final end-users, it is the highest accolade we can receive and we feel very honored indeed. We are determined to continue supplying high-quality products and services dovetailing with customer needs, and to help modernize Russia’s oil refineries." Following this award, Hitachi will aim to expand its compressor business further in Russia, where investment in oil and gas development is increasing. Moscow Oil & Gas Conferences: This private-sector organization was established in 2005 with the mission of increasing cooperation among Russia’s oil and gas companies, contractors and suppliers. Many Russian oil and gas companies participate in the organization, including Gazprom, Transneft, LUKOIL, and Rosneft.